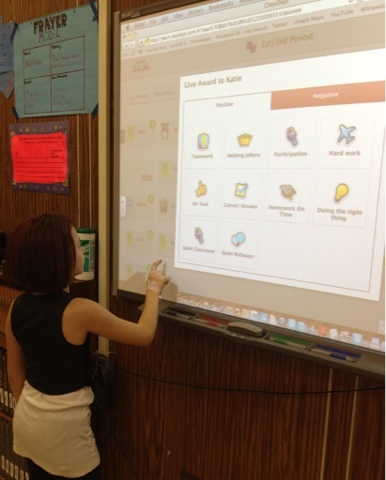 Last week I found a new classroom management system that I decided to give a try. The main issues in my classroom were talking and off-task behavior. In order for one of my classes to really listen I had to have my eyes on all of them all the time. It's really hard to conference with students when you have to be at the front of the room. This is where Class Dojo helped me tremendously. Class Dojo is an online management system that can be connected to your smart phone. I added all of my students into the system and gave them all the same avatar. Whenever students do something great I can go up to the board click on their avatar and give them a positive point for whatever behavior I would like to reward. If they are off task they can also lose a point. The system makes a sound for both behaviors that gives the students automatic feedback. What I really like is how I can walk around with my smartphone and not have to be in the front of the room. Students still hear the sound from the smartphone and everyone changes their behavior immediately. I told my students that in order to get to change their avatar they had to have 25 points. In order to get their student account where they can change it anytime they want, they have to have 50 points. They also know that if they fall below 70% positive then I will send the report to their parents. I also do the same if they are 95% positive or higher at the end of the week. The reports tell what the students gained or lost a point for and puts it in an easy to understand pie chart. My plan is after most of my students have earned at least 50 points to then start using points for an economy system where they can earn other prizes. It has really amazed me how into this system my students are. They have even changed their hallway behavior so that they would get a whole class point in the hallway. It is also very effective to have them go up to the board to give themselves a point. You would think they just earned a gold medal. So far this has been the best management system I have found. I really feel like my students are learning now because I'm spending less time dealing with behavior issues. Have you used Class Dojo yet? How do you implement it in your classroom? Hey Hilary! Even without a smartboard the students could hear the sound from your phone. What kind of technology do you have at your school? That's a bummer you don't have a smartboard. Welcome to the blogging world, I will follow you as well! They'd each start off with 20 points at the start of the week and could gain or lose from there. Sometimes I'd have it projected on my screen, other times I wouldn't- both worked equally as effectively because as soon as they heard the sound (either positive or negative), even if they couldn't see who it was for their behaviour all changed! I also used the random function quite a lot for whole class things. For example I might say "if the classroom is completely tidy and everyone is on the mat within the next sixty seconds I'll do three randoms"... They would work so hard to be there in time to sit and watch who would get the random points. Of course there were lots of opportunities to earn whole class points but the random draws really put a fun spin on it for them too!